Harrop has expanded its existing range of Australian engineered and manufactured Supercharger Kits to include the largest, most-efficient rotating group ever produced by Eaton, the TVS2650. As a master distributor of Eaton Supercharger and Traction products, Harrop is proud to release the first Australian Supercharger system featuring TVS2650 technology to suit LS3, LS7 port shape engine combinations with LSA coming soon. Harrop FDFI Superchargers feature extensive upgrades to the cooling system, to ensure optimum thermal efficiency with the inclusion of twin pass intercooler cores in the manifold integrated with a front mount radiator and high flow Bosch intercooler pump. The improved intercooler system provides greater thermal and volumetric efficiency to unleash the performance potential of the late model LS engine family. The TVS2650 Supercharger head unit is compatible with the Supercharger manifold assembly on previous FDFI2300 (Front Drive Front Inlet) systems, creating an upgrade pathway for customers with FDFI2300 Supercharger Kits fitted on the Holden-HSV VE-VF model range. Note: Bonnet clearance may be impacted on VE variants. To support extreme performance applications, Harrop engineers have developed an 8PK Front End Accessory Drive (FEAD) pulley kit to suit late model LS water pump platforms with high supercharger drive pulley wrap and using a heavy-duty tensioner assembly which provides double the torque of the factory LS3 tensioner. Coming soon... HSV models with LSA engines are also supported with an upgrade to the TVS2650 kit being released, the ideal supercharger system solution for LSA vehicles who are pushing performance beyond the limits of the factory fitted TVS1900 supercharger. Having been extensively tested and developed for over two years using SAE standards, the R2650 is validated to OEM specifications and resets the performance potential for positive displacement supercharger technology. Each unit is then individually tested in-house on a dynamometer to ensure reliability and durability. 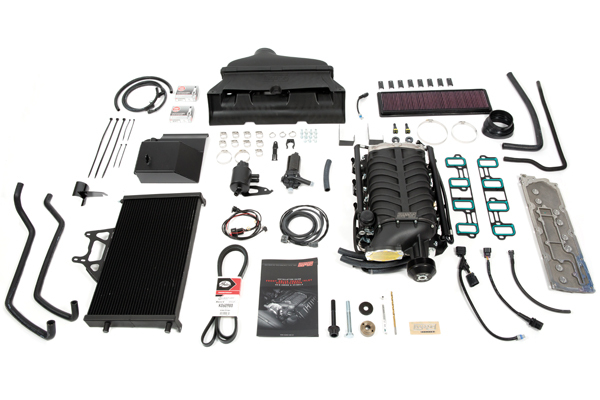 Please contact our team for further information regarding the release of our TVS2650 Supercharger Kit and components - sales@harrop.com.au.